Thank you for your interest in Frontier Adventure Sports and the adventure racing series' we stage. Adventure Racing is one of the fastest growing sports in North America and Frontier Adventure Sports is leading that growth in Canada. Our Raid the North Series (est. 1998) is incredibly popular and draws competitors from all over North America. These non-stop, 36-hour races require coed teams of four to trek, mountain bike, paddle and negotiate fixed ropes, while navigating an unmarked racecourse through the Canadian wilderness. Over the years, many of our Raid the North Series competitors have earned top placings in several, internationally acclaimed adventure races. Raid the North Extreme (est. 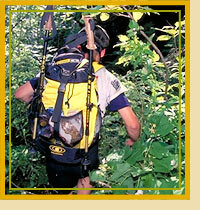 1999) is a 6-day, expedition-length adventure race that is the pinnacle of adventure racing in Canada. Taken to a new, exotic, and culturally unique part of Canada each year, this race is a regular stop for many of world's top adventure racing teams. Each season's Raid the North Extreme is televised and in 2004 the race was selected to be the World Championship of Adventure Racing. The Frontier Adventure Challenge Series (est. 2001) was created to introduce even more people to authentic, wilderness multi-sport racing. The focus of this Series is fun and accessibility - probably why the Frontier Adventure Challenge has become the largest adventure racing series in Canada. Open and coed teams of three navigate their way across an unmarked, 40+ km racecourse in both winter and summer months. In the end, teams are treated to a 5-8 hour adventure including such disciplines as: trekking, mountain biking, cross-country skiing, paddling, snowshoeing, caving, and even snowtubing! The Frontier Adventure Challenge is truly "Where Adventure Begins!" For your convenience we have created the Media Centre to provide you with the latest information and news about our events. If you have any questions, want to schedule an interview, or require additional information, please contact us.